A 71-year-old Port Coquitlam woman is in very serious condition after a collision in the 1900 block of United Boulevard, Coquitlam, just after 4:30 p.m. yesterday afternoon. If you saw anything, and have not yet spoken to police, Coquitlam RCMP needs to speak with you. The 71-year-old pedestrian was on the sidewalk when she was struck by a pickup truck leaving a large parking lot. The collision was low-speed, there is no indication of impairment, and the driver stayed at scene. 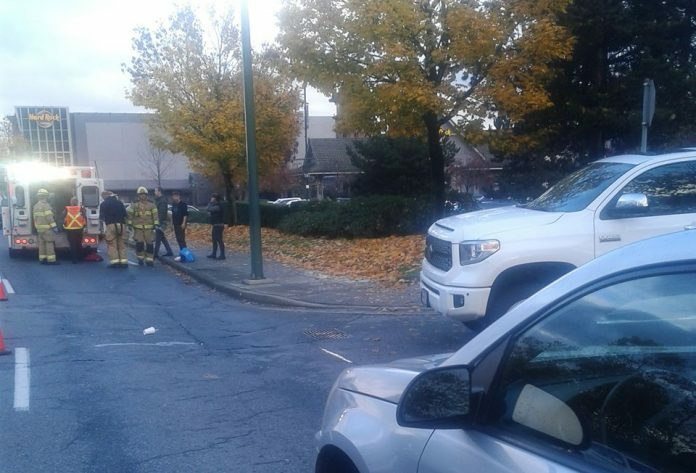 Unfortunately, this collision is a prime example of why November is Pedestrian Safety Month , says Corporal Michael McLaughlin with Coquitlam RCMP. Drivers need to be more alert in this dark and rainy season. Pedestrians need to keep their eyes up and wear bright, reflective clothing. No matter who’s at fault, a pedestrian will always lose a collision with a vehicle . If you have any information that can help this investigation, call the Coquitlam RCMP non-emergency line at 604-945-1550, ask for the Criminal Collision Investigation Team (CCIT) and quote file 2018-33744.